Join us Tuesday, October 23, 2018 at 1:30 PM (EST) for the next RAAMP Coffee Gathering: Curriculum Development Workshops. Teaching and learning with original works of art across academic disciplines can now be considered a mainstay of many campus museums. Anecdotal evidence suggests that curricular encounters with art are most effective when museum staff and faculty are equally invested in planning and conducting them. However, most non-art/art history faculty leave their comfort zone as they enter the gallery. 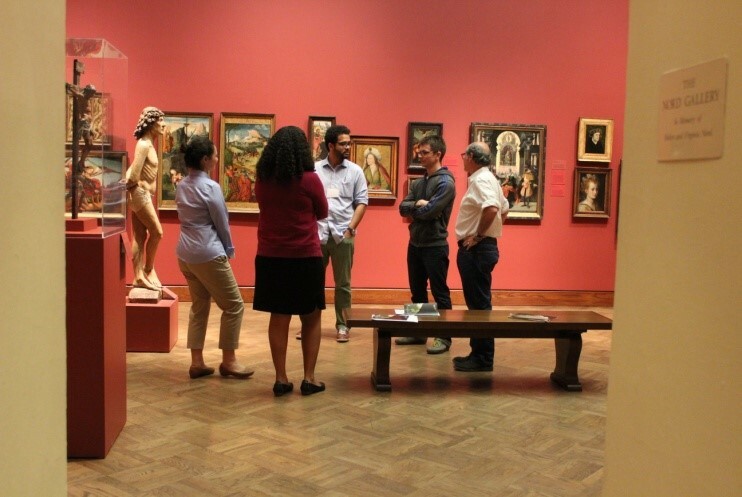 This discussion addresses different approaches to training instructors from any discipline to integrate permanent collections and special exhibitions into their teaching, highlights a recent faculty workshop model adopted by Oberlin College’s Allen Memorial Art Museum, and considers key partnerships within parent institutions to facilitate the training process. The discussion will be led by Liliana Milkova, Curator of Academic Programs at the Allen Memorial Art Museum, Oberlin College, and co-facilitated by Hunter O’Hanian, Executive Director of CAA. Liliana Milkova has held the position of Curator of Academic Programs at the Allen Memorial Art Museum, Oberlin College, since 2009, following a postdoctoral fellowship at the National Gallery of Art, Washington, DC. At Oberlin she has expanded significantly the museum’s outreach across the curriculum and developed innovative strategies for teaching with the collection across the College of Arts and Sciences and the Conservatory of Music. Milkova has organized numerous faculty workshops, overseen teaching exhibitions, and published on pedagogy, twentieth-century art, photography, and political propaganda. Kindly RSVP to Olivia Knauss, RAAMP Project Assistant, at oknauss@collegeart.org, and provide your Google address.